All interesting stuff, Secur. We perhaps need a new thread on this. But for now, my point stands in that you can't refer to, or give a paraphrased version of, that clear intuitive understanding of the electron. Because it's missing from contemporary physics. I don't say this lightly, I say it after an awful lot of reading and discussion. I've spoken to Williamson and van der Mark and Qiu-Hong Hu and others too. It's like blind spot. People can't see the omission. Here are some of my reasons for thinking his intuition of the electron, though not "clear", was better than anyone else's. Obviously, the Dirac equation. In his book, he shows why the speed of any electron is precisely c! If the electron is in front of you going nowhere, its speed is precisely zero. However I agree that there is a hidden motion witgh a speed of c.
Then he pointed out that prima facie his equation "proves" every particle must have spin 1/2 - and went on to explain why that's not the case. The clarity of his logic is always striking. I find myself discussing the distinction between experimental evidence and mathematical proof. A mathematical proof in an equation does not prove that every particle must have spin ½. For instance the offhand comment that a spherical wavefunction must have spin 0, and vice versa. The electron has a spherical symmetry and spin ½.
Symmetry is an abstract mathematical concept, energy is what matter is made of. It's the one thing you can neither create nor destroy. IMHO the former is not the cause of the latter. His meticulous explanation of where the "i" comes from in Schroedinger's equation (he explains it three different ways; they're hard to notice). His casual invention of the multi-path approach, which 20 years later became QED (Feynman always credited him). And so on. Ok, Dirac himself would agree his intuition of the electron wasn't clear. This is my point. It's only when you look for this clear intuitive understanding of the electron, do you see that it isn't there. But the question is: whose is clearer? I can't think of any theoretical physicist who qualifies. Can you say who that would be? No. The people I talk to about this sort of thing tend to have physics qualilfications, and some have physics careers. But they're in electromagnetism and optics and teaching and experiment. They aren't what you'd call theoretical physicists. If you say no theoretical physicist qualifies, but experimental physicists have a better intuitive understanding of the electron: I won't argue with that. It's a different kettle of fish. People like Carl Anderson do, in a way, have more intuition about sub-atomic particles than theoreticians do. You could mention chemists; even old-fashioned TV repairmen. And then there's Tesla! If that's what you mean, Ok, you have a point. But that objection applies to any theoretician. I wouldn't say that experimental physicists have a better intuitive understanding of the electron. Or chemists, or TV repairmen, or Tesla. I'd say a few people have some understanding, and they don't fit into nice tidy category. What do you say? If you want an appeal to authority, "finding anyone who agrees with that, try asking around for a reference" - I have none and am not going to look. OTOH if you have an "authority" who agrees with you, I'll be happy to check it out. I refer to Einstein a lot, and others. But the only authority that I really care for, is the hard scientific evidence. Such as the Einstein-de Haas effect which "demonstrates that spin angular momentum is indeed of the same nature as the angular momentum of rotating bodies as conceived in classical mechanics". But of course, to understand the electron, you have to understand the photon first. secur previous: he pointed out that prima facie his equation "proves" every particle must have spin 1/2 - and went on to explain why that's not the case. John Duffield: A mathematical proof in an equation does not prove that every particle must have spin ½.
prima facie means "on the face of it". In other words: At first glance the equation seems to say that, but of course it doesn't, as Dirac discusses in , Section 69, "The motion of a free electron". secur previous: For instance the offhand comment that a spherical wavefunction must have spin 0, and vice versa. John Duffield: The electron has a spherical symmetry and spin ½. No, an electron doesn't have a spherically symmetric wave function, because it has a spin vector. Whether an electron as such is spherically symmetric (a little "ball") is not known. Anyway, see , Section 35, "Angular Momentum", (towards the end). John Duffield: Symmetry is an abstract mathematical concept, energy is what matter is made of. It's the one thing you can neither create nor destroy. IMHO the former is not the cause of the latter. Dirac says neither "leads to" nor "cause", actually; my quick summary of his argument is a bit glib, but it's in the ballpark. See , Section 25, "Displacement Operators". I agree that symmetry is not the cause of energy, of course. John Duffield: I find myself discussing the distinction between experimental evidence and mathematical proof. You're preaching to the choir! If there's any disagreement between the two, the former takes absolute precedence. John Duffield: But for now, my point stands in that you can't refer to, or give a paraphrased version of, that clear intuitive understanding of the electron. I didn't know you were asking me to do so. John Duffield: Because it's missing from contemporary physics. Then it's unlikely I can give it. John Duffield: I'd say a few people have some understanding, and they don't fit into nice tidy category. By "understanding" I take it you mean, "a better intuitive understanding of the electron than Paul Dirac". Well, who are they? John Duffield: But of course, to understand the electron, you have to understand the photon first. I wouldn't have thought so; you could be right FAIK. John Duffield: I don't say this lightly, I say it after an awful lot of reading and discussion. I've spoken to Williamson and van der Mark and Qiu-Hong Hu and others too. It's like blind spot. People can't see the omission. I finally get it (I'm a little slow sometimes). You have found a new theory! Ok, if you want to present it, here's the place. And, these guys must be the ones with better understanding than Dirac! ... Suddenly it all makes sense. No doubt they're very smart people, FAIK. If you want to know whether they've really got something, or are just fooling themselves, I'll be happy to tell you, assuming I can find the time (and interest) to read their papers. "Principles of Quantum Mechanics", by P.A.M. Dirac. Now ask yourself this: when a seismic wave propagates through the ground, what waves? Now ask yourself this: when an ocean wave propagates through the sea, what waves? Now ask yourself this: when an electromagnetic wave propagates through space, what waves? Not spacetime, and not ether? Why does the word "the" appear in the first two questions and answers, not the third? Yes, the answer is space. I don't know why we say space without a "the". And nor do I know of anything that doesn't wave when a wave propagates through it. People are happy enough with gravitational waves, which are, according to LIGO, ripples in the fabric of space-time. But despite that, and despite Maxwell, people think electromagnetic waves are somehow unique, and are ripples in "the electromagnetic field" rather than space. Even though they can't explain what this electromagnetic field actually is. Even though there's papers and books out there on electromagnetic geometry. Even though when you assemble the various clues, you end up with a simple straightforward picture that makes perfect sense, and matches all the scientific evidence there is. "one should properly speak of the electromagnetic field Fμν rather than E or B separately"." "In the description of the field caused by the electron itself, then it will appear that the division of the field into electric and magnetic forces is a relative one with respect to the time-axis assumed..."
"Also, E and B far-fields in free space, which as wave solutions depend primarily on these two Maxwell equations, are in-phase with each other. 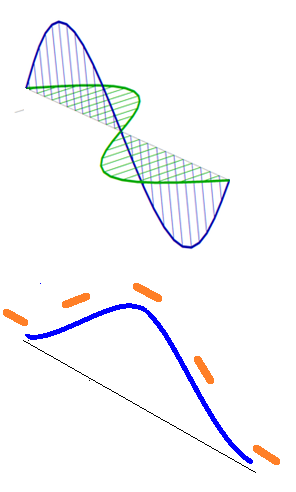 This is guaranteed since the generic wave solution is first order in both space and time, and the curl operator on one side of these equations results in first-order spatial derivatives of the wave solution, while the time-derivative on the other side of the equations, which gives the other field, is first order in time". You're in an orange canoe at sea. A wave comes at you, and your canoe starts tilting upwards. Then when you're halfway up the wave, your canoe starts tilting back down. At the crest of the wave your canoe is horizontal again, whereafter the process is reversed, until the wave has gone by and you're finally back flat and level. The tilt of your canoe relates to E, and the rate of change of tilt relates to B, these being the spatial and time derivatives of the underlying wave. Field is the derivative of potential, and we talk of four-potential, and this is at a maximum in the middle of the orthogonal in-phase sine waves in the upper portion of the illustration. That's important for later, we'll come for that. But for now, we're getting a picture of the photon as a literal wave in space, and this picture fits with Maxwell, Minkowski, and more. If you think there's anything wrong with this picture, please do say before I go on. [EDIT] this responds to your older post. Just noticed the one above. Sorry. I'll get to it soon but need to do some other things first. [EDIT] John Duffield: If you think there's anything wrong with this picture, please do say before I go on. John Duffield: I don't know why we say space without a "the". "The", the definite article, is used to "point to" or particularize a noun or object. We can do that with ground or sea, but not space because (like Chicken Man, or God) it's everywhere. If you knew how little I care what "people" think, you wouldn't tell me. John Duffield: ... books out there on electromagnetic geometry. Oxymoronically, that's old news. Einstein-Cartan is from the 1920's! Perhaps you're thinking of Baldomir? - newer, can't say better. John Duffield: when you assemble the various clues, you end up with a simple straightforward picture that makes perfect sense, and matches all the scientific evidence there is. We're on a website of Ilja Schmelzer, one of the world's leading ether theory researchers! No need for a big build-up. Please cut to the chase and tell me your favorite ether (or whatever name you might care to use) theory. I collect them like postage stamps. Is it Close? Caticha? I hope not, because I've already got those (and many more) mounted in my album, and still have plenty of empty pages. Don't forget your intuitive picture of the nature of the electron - which I suppose is matter waves in ether (or whatever name you might care to use). "Please cut to the chase and tell me your favorite ether (or whatever name you might care to use) theory. I collect them like postage stamps..."
Apologies, I think we've been talking at cross purposes, Secur. Sorry for wasting your time. (05-22-2016, 09:16 AM)John Duffield Wrote: But of course, to understand the electron, you have to understand the photon first. I could not resist to mention here that for me it was the other way around. I had "understood" (in the sense of found a way to incorporate it into my model) the electron much earlier than the gauge fields. Among the gauge fields, the strong force was the easiest, the weak force much more complex, and the most complicate thing to understand appeared to be the photon. (05-23-2016, 08:14 PM)John Duffield Wrote: "Please cut to the chase and tell me your favorite ether (or whatever name you might care to use) theory. I collect them like postage stamps..."
Ok, but it's a pity. I'm one of the few on the net who will give your ideas a fair hearing and honest appraisal, without ridicule. In fact I bet I agree with your ideas, for the most part. It's not your ideas, but the slow pace of your exposition, that I can't help poking (friendly) fun at. I apologize, but can't promise not to do it again; patience is not one of my virtues. The other day I took a walk in the park with a 7-yr old grandson. Real bright kid, respectful, full of life. But he took 10 steps to my one. Literally ran rings around me! When I sat down on a bench to catch my breath, he just couldn't believe I needed it. He can keep going like that for 12 hours straight. Of course I didn't mind his laughing at me; all too soon, he'll know what it's like. Well, the slow pace of your exposition reminds me of that walk, but now I'm the 7-yr old! Any time you want to continue - slowly, or preferably more quickly - please do so. I'll be here for a few more years, with any luck.